Expect great visual art from a curated selection of today's emerging young artists, including Airell Segovia, Allison Tan, Anna Orlina, Dans Bermejo, Dee Jae Paeste, Erica Ng, Jess De Leon, John Paul Duray, Julia Tabor, Kara Pangilinan, Karen De La Fuente, Ku Rumillo, Lee Caces, Miguel Alberto Antonio, Tyang Karyel, Valerie Harley, and Vincent Kristan Quilop. There will also be a live mural by Dee Jae Paeste and Tyang Karyel, and a gig photo exhibit. As for our musical participants, expect to shout, sing, and dance along with acts carefully chosen by our festival organizers. We are celebrating the music of those who have made significant contributions to the music community. We have bands who have represented our country overseas, such as Music Matters 2015 representative Farewell Fair Weather, Baybeats 2015 participant She's Only Sixteen, and two-time Awit awardees Conscious and the Goodness, who played at the Singapore Jazz Festival 2016. We have acts who have done projects overseas, such as the Ransom Collective and singer-songwriter Reese Lansangan. We are also featuring acts who have opened for visiting overseas acts, such as Fools and Foes, who have opened for Lucy Rose. We are featuring acts who will open for the Ting Tings, Temper Trap, and Yuna at the upcoming Wanderland 2017 festival such as Ms. Lansangan, Tom’s Story, and Banna Harbera. There will also also acts who have been Tagaytay Art Beat favorites and are among the most popular and in-demand acts today, such as Bullet Dumas, Autotelic, SUD, and Jensen and the Flips. We’ve got acts who will add to our dance vibe with their unique musical stylings, including Motherbasss, Tandems ’91, Moonwlk, and Rob and The Hitmen, plus Logiclub’s CRWN, Ninno, and Dante x Amigo. Finally, we are featuring Mayonnaise, a band which will make the crowd sing and shout along with their anthemic tunes. They are one of the most significant bands in the independent music scene. Tagaytay Art Beat tickets are selling for 1000 pesos. 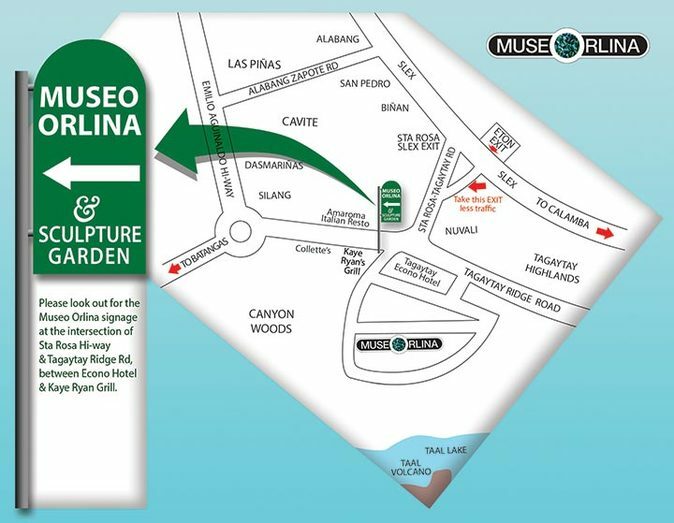 Participants can also avail of a 1500 peso VIP pass package which includes free access to the Museo Orlina and its collection of art by Ramon Orlina, access to the roofdeck where they can meet and hang out with the artists, an event t-shirt, and other goodies from the festival. Those who want to go can check out our Facebook page (http://facebook.com/tagaytayartbeat) for more details on how to order tickets. What makes this different from last time? 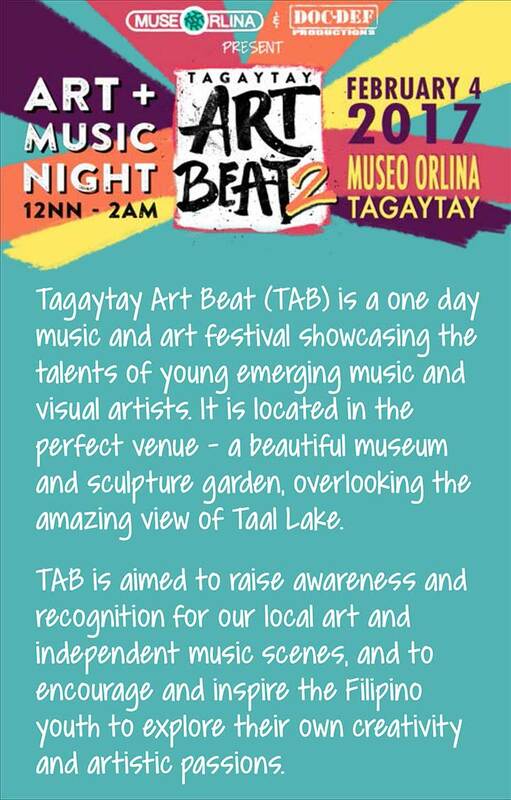 For more information on Tagaytay Art Beat, please contact Ren Aguila at renpaul@gmail.com. You may also visit our event page at https://www.facebook.com/events/345773952470882/ or check out our Facebook and Instagram accounts (tagaytayartbeat) for more details and updates on ticket ordering and the event itself. We would like to thank our media partners for their support: Scout Magazine, Art+ Magazine, WhenInManila, and Jam 88.3.here to edit.